Cold water coming from the overhead tank or the main water line fills the assistant tank, then comes to the main tank and then to the inner vacuum tubes and gets heated by the sun. As warm water is lighter than cold water, it rises to the top of the vacuum tube and then to the main tank while the heavier cold water sinks to the bottom of the tubes to replace the heated water and gets reheated by the sunlight. This natural phenomenon is known as thermosiphoning. 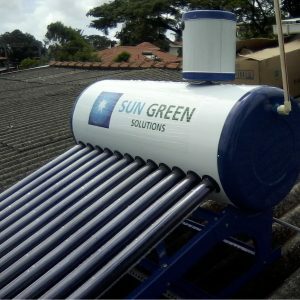 Thermosiphon solar water heating system is an excellent way to start saving on your electricity bills. The tank is installed above the collector tubes to allow the thermosiphon phenomenon to occur, circulating water from collectors to the tank. The advantage of this type of solar water heating system is that there is no costly and corrosion prone copper piping involved, making these open tubes the most cost effective and hygienic. • Takes very little time as 2 - 3 hours for the water to attain 95 degrees Celsius (from ambient temperature) under bright sunlight. Sun Green Solutions Private Limited is engaged in providing renewable energy solutions to the domestic and industrial sector in Sri Lanka. We are an associate company of Sunteks International, the market leader of sky lighting in South Asia.